I had the chance to interview Janice Hahn, LA City Council member and candidate for Lieutenant Governor in 2010. We'll have the video up on a Calitics soon. One thing I asked her about was high speed rail - she's shown strong support for HSR recently, and I asked her if she'd be willing to be a statewide advocate for HSR should she be elected, since we seem to lack such an advocate right now. "Absolutely," she said, and proceeded to make a strong case for why California needs HSR. Daniel Krause and I took a quick scoping tour of the proposed HSR route in San Diego, from the Santa Fe Depot north to Rose Canyon and University Towne Center. It seemed clear to us that a downtown station would be the best location for an SD station. Downtown San Diego has become a major regional destination, has a lot of density, and is well-served by the existing mass transit (San Diego Trolley). An airport station, which has a lot of local momentum, would be much less effective from the perspective of potential riders and certainly from the perspective of linking HSR to urban densification (which downtown SD has accomplished quite well). We also took a look at Rose Canyon, where CHSRA proposes an at-grade implementation. BNSF still uses this route for freight service, so track-sharing is an issue. Adding new tracks would mean encroachment on Rose Creek, which is what worries locals. Finally, we drove up to University Towne Center mall, which is an awful TOD location and doesn't seem like a good place for an HSR station. A possible alternative to Rose Canyon is possible though via a tunnel under UTC, along Nobel, and then south along I-5. Feel free to use this as an open thread for anything HSR-related, whether it involves San Diego or not. I was opposed to the airport plan until I saw a link from another poster here on the relocation of the airport terminal to the other side of the runways. given the new location, it would be a short trolley ride into downtown and a *much* easier track alignment for HSR. Even if the train terminated in Santa Fe, riders would still need to take the trolley to their final destination (one of the downtown hotels) ... so I don't see the objection to an extra trolley stop or two. Regarding UTC. Although the mall looks like the poster-child for urban sprawl, it is actually in the hub of apartment mecca in San Diego. There are a huge number of apartment buildings in the general area, a fair number of office complexes, and the UCSD campus. If San Diego has a 2nd downtown, UTC would be it. That said, the area has a lot of topography and is probably an expensive route choice. I'm in favor of 15 south to 8 west to an airport or downtown station. I don't see the real need for a north-county station (even though I live north). Anyone advocating a downtown SD station also needs to address the issue of stabling a sufficient number of trains overnight. If the HSR tracks will be elevated, one option would be to continue south a single elevated track leading to an elevated yard above those for legacy passenger and freight rail, near Petco Park and the convention center. Another option would be to have four elevated tracks at the station and then to just keep going with four tracks for the length needed to accommodate the required number of trainsets overnight. I had earlier estimated about 45 spaces would be needed in SD, based on the service model described in CHSRA's 2008 Business Model (supporting doc 5). Now that CHSRA has figured out that a yard in LA would be a Really Good Idea™ the number will be substantially lower. It's time for CHSRA to spell out how large it needs to be (that goes for the other stabling yard, too). It might be possible to have the station at Lindbergh and the yard stretching no further south than Santa Fe Depot. Either way, CHSRA may need FAA clearance to run elevated tracks and overhead catenary wires so close to the end of the runway. I don't think it'll be an issue, but measure twice, cut once etc. Of course, if an alternate site for the yard somewhere else can be identified, hooray. My point is that any consideration of station location options should include discussion of the stabling yard. @RFDog: The only thing I have to add is that, because of UCSD, there is very extensive and heavily used public transportation within the UTC area, connecting all those apartments and condos to UTC as a central focus area. The SuperLoop bus route is a perfect example of how regional transportation in the area has improved greatly, compared to just 10 years ago (when I was a freshman). UTC itself is set to be rebuilt as a transit-oriented development, with a trolley stop, quicker bus access, and more housing onsite. Regarding downtown hotel users: In time, the blue line will no longer extend up the coast - the green line and mid-coast line will extend downtown, I believe. So if the stop were at the airport, they would have to take a trolley downtown AND transfer to another, to get to any downtown destination. If it terminated downtown, riders could transfer once, to ANY trolley line AND the Coaster, to get anywhere in the county. This is a good overview of what the new UTC mall and residential development will entail. Also, UTC is one of the most densely populated regions of San Diego and is the job epicenter of San Diego County. Most business travelers will end up within 5 miles of UTC. @Raphael: Why wouldn't some space in Miramar be suitable? That seems like the easiest place to park however many trains need to be parked, from 5 to 45. Thanks for that info about the plans for UTC. That's good o hear, and I know there are plans to do a Trolley line up there. One additional issue for a UTC HSR station is the 24 station limit written into Prop 1A. By my count UTC would be station #25. Would it be worth deleting another station somewhere else? I'm not inclined to think so. Thoughts? Thanks in particular to all you San Diegans commenting on this. Be sure to submit your comments on the proposed alignments to the Authority by Friday. Matthew, thanks for that link. When we were looking over the bridge on Genesee into the canyon we could understand why neighbors are cautious about HSR through the canyon. It is a beautiful place. To me that means both neighbors and CHSRA should seek a mutually agreeable solution, instead of pushing to have the line end at Qualcomm Stadium as Donna Frye prefers. @Robert: You're so much more politically agreeable than me - it's a good thing you're running this site. Interesting point about the number of stations. As long as the train terminated somewhere along the mid-coast trolley line, I'd say the area will be sufficiently served. I just don't think it will do to end the train somewhere that will require two trolleys and a bus to get to any destination - enough to push anyone back into their cars. You hear me, Qualcomm Stadium? I'm talking 'bout you! @Robert: Just counted, and you're right about 25 stations, and that's not even including the penciled-in Hanford stop. This poses a difficult dilemma though, as that general area seems like a very good candidate for a station. Miramar does seem like the best site for an overnight stabling facility (unless some room could be made at Lindbergh...). It's not close enough to be considered ideal, but it's probably the closest location with enough space. Id still rather see a more easterly inland route that would serve more more people who'd actually use hsr, and avoid serving the more upppity coastal enclaves who are just going to gripe about it anyway. Let's not forget about how many people will be able to walk to numerous office buildings, condos and other attractions that dowtown San Diego has to offer if the HSR station is located at Santa Fe Depot. I walked for 10 minutes from the Santa Fe and and walked past incredible amounts of development. On the other hand, if all downtown-bound riders are forced to connect to another form of transit (Trolley or taxi) at an airport station, not only will this be a large inconvienence to those that could walk from a dowtown station, it will likely strain the capacity of the Trolley system, and probably break the system's ability to handle people at rush hour, regardless of the new transit hub being planned at the airport. I can only envision how many people will not want to ride HSR if they are required to squeeze themselves and for some their large bags into already crowded LRT trains or are left stranded at the platform. With HSR downtown, for those that still need to hop onto a Trolley to reach, say the convention center, capacity will have freed up on the Trolley lines because many normal daily commuters will get off at or before the Santa Fe Station and the adjacent American Plaza Station, freeing up space for HSR riders. And yes, a downtown station would provide access to every Trolley line in the system and eliminate double transfers, a situation an airport station will not likely be able to acheive. In regards to the UTC site, this may warrant a station with the Trolley coming and new TOD. Not sure how to fix the straight jacket of huge auto-oriented boulevards that surround every super block. Not a walkable environment for sure. But given the density, UCSD and new TOD, I believe it is work studying further in the EIR/EIS process. However, at some point this station limit is a problem. One thing to consider is would it make more sense to have a UTC and Downtown stations or to have a Downtown and Aiport stations? An station in more inland may make sense with a commitment to TOD due to increase access for the huge populations living east of the coast. However, this still needs to be coupled with a downtown station for all the issues discussed in my last comment. I believe any alternatives without a downtown station is a non-starter if a HSR is to be successful in San Diego. Overcoming the challenges of getting downtown from an eastern location seems like a real challenge. Not sure how to resolve that issue. Robert, since you said it's okay to talk about things that aren't SD-related, you should probably read and bookmark this Guardian article quoting a whistleblower from the International Energy Agency, who says that peak oil is imminent and IEA projections of oil production were distorted upward under US government pressure. Something tells me HSR is going to look like a bargain in 5 years. regarding the 24 station limit: AB3034(2008) basically specifies the parameters the system has to conform to wrt how funds raised through the sale of state bonds are spent. If community XYZ wants a station, it can be funded without any state bond money at all and its addition does not reduce the value of the investment made by state taxpayers, CHSRA could probably go ahead an build it. Los Banos is an exception since the bill explicitly bans a station there in an effort to avoid sprawl impacts on the nearby grasslands (or so Silicon Valley real estate interests would have you believe). As for the map already showing 25 stations, the one in the mid-peninsula was never confirmed. CHSRA is considering Redwood City, Palo Alto, Mountain View - or none at all. I believe there's also a question mark over the City of Industry station, though Pomona is reportedly mustard-keen to get one. Unfortunately, the distance between Pomona and Ontario Airport is quite short, which is suboptimal for HSR operations. Also, with UPRR not co-operating, the alernative of running HSR tracks in the I-10 median could prove preferable to an aerial above 1st/State/Main+Airport Dr or else Holt Blvd. At ONT, the three terminals are strung out on a long east-west line. Wherever the airport's HSR station ends up, there will need to be a fast people mover. It would also serve air passengers transferring between terminals and those using the long-term car park. 2) a regional transit line that leverages the tracks for the fully automated service (1) for a short section of its route. There and only there, drivers would relinquish control of their vehicle to the automated system. Beyond the ONT airport property and the HSR station, the transit line could in theory operate in streetcar mode, that would need to be decided in a cost-benefit analysis. Even so, constructing and operating a combo people mover/transit system in addition the HSR line would be expensive. Any extension beyond the essential people mover functionality would need to be justified via credible ridership forecasts and transit-oriented urban planning. The western end point could be the new football stadium in the City of Industry, with full service only on game days. Usually, trains would terminate at an intermodal with Pomona Metrolink. An extension to downtown Rancho Cucamonga is a far more tenuous proposition, last not least because there is no discernible downtown. The site of the town's existing Metrolink station appears to have been chosen exclusively for the benefit of constructing a vast at-grade park-and-ride lot. As in most of SoCal, there is no TOD at all there right now. Unfortunately, the distance between Pomona and Ontario Airport is quite short, which is suboptimal for HSR operations. And fortunately, since much of the route of HSR in the LA Basin follows existing Metrolink lines, they could use the opportunity to grade-separate and electrify Metrolink, and operate it as a two-line S-Bahn, with a Sylmar-Anaheim/Irvine line and an LAUS/LAX-Ontario line. Pomona would get fast connections to LA and Ontario, the Valley would get fast connections to Downtown and Burbank, and everyone would win. Who knows, they could even cut back HSR from Anaheim to LAUS, and invest the money in rapid regional service from Sylmar to Anaheim/Irvine. It'd cost less, allowing them to spend the extra money on better connecting service, like taking the Green Line to Norwalk/Santa Fe Springs and the Orange Line to Burbank. Again, everyone would win, except Pringle's ego. What's the plan to start building American bullet trains instead of relying on French, German or Japanese technology? I mean we do have Stanford, UC Berkeley, UCLA and Cal-tech in this state with a bunch of brilliant scientists and researchers. Couldn't California just create and mass-produce its own high speed railcar instead of importing them? Then we can start exporting California made bullet trains to countries that are interested in HSR and we can start becoming competetive against the French, the Germans and the Japanese. Think about it, not only it benefits society, but it'll also bring back railcar production back to America. And California can lead the way in making and exporting Made in USA bullet trains all over the world. Anon: no, there are no such plans. The problem is that the US has lost all expertise in building trains. When a company without experience in train manufacturing gets into the business, the results are usually abysmal - just look at the Boeing-made lemons BART uses. You don't need teams of elite-educated researchers to build trains. You need a lot of engineers with the necessary background and a business culture that nurtures them, and the US has neither. I visit San Diego once a year or so. It seems to me that it would make sense to have both downtown and airport stations. Yes, they are close together, but this is the end of the line so it is not inconveniencing many through travelers. And there is not good public transportation between the airport and downtown now - being able to hop on the train at SAN and go downtown would be a real advantage, and I'm guessing many area residents would use the train to get to the airport. It is doubtless that using american-built railcars would be preferable, and ultimately, would best serve the goals of the project (like economic development in the US). Unfortunately, it's not quite so easy. Since there isn't anyone in the U.S. who has a high-speed platform, or even potentially the technological experience to build one, this would basically mean engineering an entirely new platform from the ground up. Now this isn't impossible. It would require a significantly larger investment however (in order to fund research and engineering). The HSR project would probably be set back at least a few years as well, as the time taken to engineer and build such trains would undoubtedly be much greater than using off-the-shelf units. That being said, maybe there is a middle ground to be found. While it may not be practical to engineer a HSR platform from the ground up, that doesn't mean that the railcars couldn't be built in the U.S. The key would be convincing whatever company was chosen to build the trainsets to set up a factory in California, rather than building the trains overseas. While some of the benefits from that would still undoubtedly go overseas, the trains themselves would still be built by Americans. Now, in the long run, it would probably make sense to have a HSR platform designed and built completely in the USA, especially given all of the HSR corridors that are currently being planned. This would only be possible, however, if politicians, and people in general, were willing to be more flexible with public money (good luck getting private investors at a time like this). In order to have anything done in a reasonable amount of time, engineering would have to start almost immediately. Interestingly enough though, this might get stimulus money spent sooner, which, ultimately, is what needs to happen with stimulus money. There is no point of having an airport stop if the only purpose is to get people from SAN to downtown. There are already plans to put light rail and COASTER stops at Lindbergh; a 1.5 mile HSR trip makes little-no sense at all. The airport HSR station becomes dead weight, only serving a few people in Escondido who want to get to the airport. Most of the people at our universities are from other countries anyway. We may as well let them do all the hard development work and we can just buy in the technology we need. What are the chances of utilizing the HSR tracks from LAUS to ANA for express commuter service. For example running trains capable of 120 mph out of Laguna Niguel or even stations south of that making all metrolink stops through Orange. Then it would transfer to the HSR tracks just before ANA and go nonstop until transferring back to the standard tracks just before LAUS. The trains would be fitted with communications equpment for both systems and could use electric traction for the ANA-LAUS portion. Matt: since Metrolink isn't even proposing upgrading its system to include electrification and higher speeds, the chances of this happening are low. LA barely has plans for subway construction, let alone good S-Bahn-style service. It's a pity, because a lot of the ideas it floats, like LAUS-LAX service, could work well if they were pitched as regional rail. It's easier to sell people on eminent domain for a 160 km/h train when the train will stop in their neighborhoods. Yes, because heaven forbid our stimulus dollars should create jobs in the US. WRT peak oil, the sooner the better for the revolution of the auto industry to alternative fuels. This week's Sunday Train: The Birmingham Hub is, alac, not about Express HSR at all, not even Express HSR east of the Mississippi. And it rolled into Daily Kos station three minutes late, at 7:03 EST (4:03 Pacific), but wachyagonnado about a late train in the US. I hear it was due to a freight train on the tracks. AFAIK BART has cars either from Rohr or Alstom. San Francisco had Boeing Vertol articulateds which were sadly never properly debugged and thus had a short service life. Rumors of the death of oil are premature. Remember most all of the producing countries are dirt-poor third world, including the pseudo-rich ones like the emirates. They have to pump in excess even tho it is in their best interests to cut production. So they are going to pump it and we are going to burn it likety-split. The crunch will come for sure, but the timing will be a surprize, just like the next crap-out of our irrationally exuberant stock market. the FRA would first need to allow FRA-compliant Metrolink/Amtrak and non-compliant HSR trains to share track. Unlike Caltrain in the SF peninsula, there is a lot of freight traffic between Redondo Junction and Fullerton, so it's unlikely such a mixed traffic waiver would be issued. OCTA is planning to increase Metrolink service between Laguna Niguel and Fullerton, but there's insufficient track capacity to do so out to LAUS. I'm not sure if the entire sections is a bottleneck or just the Hobart Yard. With a turnoff onto UPRR track at Los Nietos, it might be possible to have a limited number of Metrolink trains run from OC to Ontario airport, perhaps out to San Bernardino. Unfortunately, for now at least, UPRR refuses to host any passenger trains at all on its Colton ROW. Part of the problem is that that is currently single track. The other part is that LA county runs its part of Metrolink on a shoestring, so there's not enough money to run any passenger-only heavy rail tracks past the airport terminals. it'll also bring back railcar production back to America. There's railcar production in the US. . . there is life east of the Sierra Nevada. Places where people use electric trains to get places. So the manufacturers build the railcars near those places. Because of the Chatsworth accident, the FRA is mandating PTC on all lines used by passenger trains. It considers PTC to be acceptable time separation, which allows compliant and non-compliant trains to share tracks. Unless the freight railroads manage to get out of the PTC mandate, the FRA problem will solve itself by 2012. "Rumors of the death of oil are premature." This is what is called a straw man argument ... replace a serious argument with a much weaker substitute and then argue against the substitute. If we are at Peak Oil, any idiot can tell it does not mean the "death of oil" - if we've used half of it up, we would therefore - by the definition of "half" - have an equal amount left to burn through. Its just that we are not going to see rapidly expanding supplies such as we saw in the 80's. Rather, supplies of conventional oil will dwindle, and supplies of non-conventional substitutes will not expand rapidly enough to provide the kind of growth in supply we have been accustomed to. As to whether you are trying to deliberately deceive, or whether you yourself have been deceived by some prior con-artist, since you post as an anonymous coward, there is no basis for even guessing. Obviously the price will tend to rise over time, but what is likely to be more striking over the coming decade could well be the volatility of prices, which will of course hammer the US worst among industrialized economies, because we have gas tax policies inherited from when we were still an oil exporter. Unfortunately, no there are no plans to build our own HSR cars. Even the Acela which runs back east, isn't American made: it's Canadian and French. Yes, we lost the ability to make trains, and inevitably we will probably start losing out in the world market as more countries develop their own HSR plans. Most of those contracts will probably be eaten by the French, Germans, and the Japanese. All the while these countries develop HSR plans, they're gonna start cutting back on airplane orders from Boeing for domestic airtravel. Yeah, the US is pretty much screwed and we're probably gonna have another "too big to fail" type of bailout towards Boeing in the near future. But in the rong lun, it we may get a Made in USA bullet train, but that would be years off and until we are too late to realize that we lost out on a huge money making export. So for now, its gonna stay with importing a French TGV or a Japanese Shinkansen (I'm partial to the latter because they look soooo cool! LOL) and have them up and running in our state. While they're running we're goin to be doing all the maintenance on those trains so we'll gradually need engineers and service personnel to keep these trains running. Only then would we gain enough experience back to build a Made in USA bullet train. Kinda sad when you think about though from that perspective. The best country with the best scientists and researchers in the world can't develop their own HSR cars. But I guess that's the price we pay for sticking with cars and planes for so long while the rest moved ahead. Bullet trains, or trains of any kind, aren't that big of a moneymaker. Unlike with cars, the main cost of public transit is the operations and construction of tracks/busways, rather than the equipment. In particular, most of the jobs go to local builders, drivers, and maintenance workers, rather than to whichever company builds the rolling stock. With high-speed rail this is even more true. A full-length high-speed train costs about $50 million, about the same as 2 km of at-grade track or 300 meters of tunnel. The US should focus on what it has comparative advantage in. Rolling stock is a lost cause, but solar panels aren't; the US has the capability to manufacture them well, but because it doesn't encourage green energy, Europe is overtaking it, as it did with trains 40 years ago. How about asking for sources cited instead of just denying without precedent? Because I already know that almost everything after the first sentence is false. On a related note, does anyone know where to find the exact regulations regarding FRA compliance and time separation? O/T: the LA Metro Rail Gold Line Extension opened today. If they were smart enough, they would've installed those seats parallel to the window to accomodate more standing room passengers in such a public transportation dependent area of the city. Light rail is pretty much defined as a low-capacity system anyway (higher than buses but it's all relative). If they they needed the kind of capacity to warrant that much standing room, they might as well build a subway. You're right, it was wrong. The FRA is mandating PTC by 2015, not 2012. But the freight railroads are already grumbling. As for the FRA and PTC, Amtrak seems to believe that once PTC comes online, it will be able to use lighter equipment. It's contained in its report about how with 10 billion dollars it could make the Acela trains slightly faster. The report's offline now, but it states that the FRA would come up with standards for lighter trains once PTC ensures compatibility is no longer an issue. It makes no mention of UIC standards or ERTMS, but hey, you can't ask for everything. When a company without experience in train manufacturing gets into the business, the results are usually abysmal - just look at the Boeing-made lemons BART uses. ]Currently Bart is deciding on who will build the next generation of cars due soon. Here's the latest bart "the next generation" info including a list of possible suppliers nextbart Most of the current fleet has been in service for decades. Its definitely time. here the list of potential suppliers its a long list, pretty much includes everyone except Grandpa Hickman's pickle barrel and rail car supply. All Aboard: no, I meant the Muni cars, not the BART cars. I misremembered. As BART is broad gauge, squeal in curves is certainly a big problem. Maybe solving that should be part of the specifications for the new suppliers. From my own experience, a train slowly squealing round a curve is far more irritating than a TGV wheezing by at full speed. @Andre: Perhaps split axles like the talgo trains? It makes no mention of UIC standards or ERTMS, but hey, you can't ask for everything. What's the functional difference between "lighter trains" and UIC standards? What functional difference is there between ERTMS and ACSES? I think bart is already considering the axle thing for the new cars. A light train is one with low axle load. The international de facto limit for high speed trains is 17 metric tonnes per axle, above that the maintenance overheads on trains and track geometry become excessive. For UIC compliance, the design has to meet that organization's criteria for passive safety (buff strength etc.) Some HSR manufacturers argue that thanks to modern train control systems, active safety is now so high even UIC compliance is overkill. National railways are not required to adopt UIC regulations. ACSES is a system that causes a train to automatically apply the brakes if the driver exceeds the local speed limit or is about to run a red light. There are plenty of other systems that accomplish much the same thing, e.g. ATC in Japan, TVM-430 in France and the European signaling overlay standard ETCS. Legacy systems train control systems rely on beacons (balises in French) embedded between the rails at regular intervals and other wireline infrastructure. This is very reliable but expensive to install and maintain, especially as an overlay system. ERTMS is the European Rail Traffic Management System. Two of its basic building blocks are ETCS Level 2 and GSM-R, an international standard for wireless communication between the trackside infrastructure and driver cabs. In-cab signaling is essential for safe train operations above approx. 250km/h (155mph) as drivers are no longer able to read trackside signals reliably at even higher speeds. In addition, ERTMS provides a single, open European standard for managing traffic on the (high speed) lines on which it is implemented. Older proprietary systems accomplish the same thing, but the EU wants to make progress toward a single technology to facilitate cross-border rail traffic. Imagine what an embarassment CHSRA's lousy cost, ridership and job creation projections will be to the Obama administration. The Feds would do well to ask CHSRA for some real accountability (not the least of which would be - how many US jobs will be created with that money), before they send CHSRA billions of tax payer dollars. wel considering the dismal result of the last adminstration's tax cut/no regulation approach to the economy, what do you suggest? It so happens that little of the stimulus money has actually been pumped into the economy yet as most projects are just getting off the ground. YOu don't jut write a check and the next day everyone is working, this will be a gradual increase, and what is likely the timing will such that washington will get the money flowing and people to work over the summer and just in time for the midterms to ensure continued success at the polls, They aren't stupid. Yo can't blow the wad to soon, as other things, stocks, housing, etc, need time to recover as well, and if the timing is right, it will all come together for a nice recovery. Its already starting to happen little by little on global basis. So sad to be rooting for failure. you know anon, you people are so bitter that not only did you lose, but that you lost big, all over the place, and not only did you lose big all over the place, but were your policies resulted in such grand failure, that you just can't stand to be in your owns skins. Subsequent analysis by Amtrak suggests achieving 2 hour and 15 minute service between New York and Washington in the long-term by 2030 will require modifications to existing equipment, or deployment of next generation rolling stock, to allow required speeds through curves, as well as expansion of capacity into and through Manhattan, NY. Table 2 includes estimates of costs required to replace Amtrak’s existing NEC fleet with next generation equipment. As discussed above, this next generation of equipment has the potential to be lighter, and thus faster, than the current generation. However, performance specifications for such equipment will need to be developed and will depend in part on emerging standards for positive train control (PTC) and crash avoidance systems. In other words, Amtrak is planning to come up with its own specs, instead of buying off-the-shelf equipment. Subway operators need the flexibility of changing train length or swapping out a damaged/dirty/vandalized car at short notice. For that reason, designs with Jacobs bogies or Talgo-type wheelsets are rarely if ever used. The latter get their yaw stability from a passive steering mechanism featuring four rods that are attached to the bodies of the same and the next/previous car. A more promising approach for BART's squeal problem might be conventional bogies equipped with radial steering and yaw damping. Radial steering is also sometimes used for heavy locomotive bogies that feature not the usual two but three or more axles. If the individual rail cars are short enough, two radially steered pivoting wheelsets will suffice and not exceed the axle load limit imposed by track design and/or maintenance overhead considerations. The bodies of short rail cars can be wider than usual, at the expense of usable platform length lost due to the sections in-between cars. If in addition to wheelset steering, a distributed EMU design also features independent axles to avoid wheel slip on the top of the rail, yaw behavior has to be stabilized with traction control. This was actually implemented in the Siemens ULF streetcar, but afaik not yet in any heavy rail system. "Subway operators need the flexibility of changing train length or swapping out a damaged/dirty/vandalized car at short notice. For that reason, designs with Jacobs bogies or Talgo-type wheelsets are rarely if ever used." Is there no limit to Rafael's expertise? An advantage of ERTMS over TVM430 is that it is dynamic (as opposed to static). With TVM, train A's computer doesn't know the speed of Train B ahead of it and always assumes worst case: B has stopped. That obliges A to remain within stopping distance of B, that is 4 minutes+1 minute added by the SNCF for extra safety. Max: 12 tp/h. With ERTMS, train A knows train B's current speed. This greatly reduces headway and can allow up to 20 tp/h. The cost of installing ERTMS (in France) is €1 million/km. This is not cheap, and may be considered overkill in most cases. Replacing the "E" (European) by a "U" (universal) might make it more politically acceptable in the US. That's what I had in mind. Independant wheels lack stability at high speed but are perfectly safe at commuter train speeds. "In other words, Amtrak is planning to come up with its own specs, instead of buying off-the-shelf equipment." You're confusing specs (i.e. performance requirements) with implementations. The former are needed to identify a shortlist of candidate solutions, some or all of which may be off-the-shelf products. The biggest issue is if Amtrak can get a waiver from FRA to operate non-compliant gear on the NEC, which it owns. If not, then none of the off-the-shelf designs available on the international market will make that shortlist. In the context of the Acela Express, FRA was crazy enough to actually add weight to an active tilt train for the sake of passive safety, which will never make train-on-train crashes at even moderately elevated speeds survivable (cp. Chatsworth crash). This drastically increased maintenance overheads, energy consumption and fares for Acela. The Obama administration's FRA may strike a more intelligent balance between the requirements of passenger and freight rail operators. The situation is somewhat analogous to but more complicated than Caltrain's in the SF peninsula, where a switch to non-compliant commuter rail rolling stock is supposed to happen in conjunction with signaling upgrades. Note that Caltrain has shown UIC-compliant rolling stock to perform as well or better than FRA-compliant equipment in grade crossing accidents. Thanks to the full grade separation that California HSR will bring, this will soon become a moot point in the SF peninsula. However, the results will remain relevant between San Jose and Gilroy as well as elsewhere in North America. unless I'm missing something, none of the rolling stock on the Madrid metro uses Jacobs bogies or Talgo-style wheelsets with steering mechanisms, both of which make it difficult to decouple cars from one another. The end cars of subway trains are always different from those in the middle, but that has no bearing on the issue of how easy it is to reconfigure a consist. Please elaborate, I don't understand the point you're trying to make. thx for the clarification on the additional capacity that will be enabled by ERTMS over TVM-430. "Independent wheels lack stability at high speed but are perfectly safe at commuter train speeds." That's too broad a statement. Talgo uses wheelsets with independent wheels for the unpowered cars of all of its trains, including the 350, which as the name implies is certified for a top speed of 350km/h (204mph) in commercial service. Talgo wheelsets are stabilized via a passive steering mechanism that always keeps them perpendicular to the rails. For details, see the (terrible) Talgo web site » Menu » r&d » "Technological Principles" » "Axles Permanently Guided on Track At Zero Angle". Talgo relies on conventional locomotives/tractor cars with conventional powered bogies for traction. The new AVRIL will feature two regular plus two Jacobs bogies (8 powered axles) in addition to 11 unpowered wheelsets. Thus, 8/19 = 42% of all axles will be powered, close to the 50% of distributed EMU HSR designs. Relative to the RENFE 102, the (modest) innovation in the Avril is that thanks to the Jacobs bogies, the second and penultimate cars can house some of the transformer and battery gear while leaving just enough room for an aisle. This permits passenger seats in all cars. Talgo evidently decided against attaching any traction motors to the outside of the wheelsets or developing wheels with integrated motors. 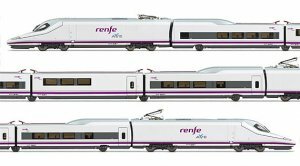 The former would probably not be feasible anyhow on account of available lateral clearance so close to the top of rail, the latter would preclude the variable gauge feature required to satisfy the company's primary customer, RENFE. Even in a fixed gauge variant, any motors would be constrained to an unusual and probably suboptimal disk form factor. @Andre: you speak of ERTMS Level 3 (moving block) which is only a dream at this point. ERMTS Level 2 is conceptually similar to TVM. In general you must always assume the train in front of you is stopped, in the event that it suffers a derailment. @Rafael: many modern subway trains are permanently coupled "boa" trains with a continuous interior space. They're about as easy to uncouple as an articulated bus. Allaboard - just goes to show how simpleminded and out of touch you are - I'm a democrat, voted 100% dem, and donated to the DNC in the last election. And I'm watching our democratic political representatives go off the deep end fawning all over the pie in the sky concept of a high speed rail without a bit of sense to it, and I'm not going to sit idly by and lap it up like a moron. Now, because Im a democrat that thinks CHSRA are a bunch of underhanded snakes - how do you reconcile that in your little 'your so sad you lost' tirade? The point still stands that Obama has high expectations for the way this stimulus money will be spent, (shovel ready, US job creation, to name a couple) and transparency that will BE REQUIRED go with it - and his administration is not going to sit idly by and watch crooks and liars fake up their plans and results, trying to pull one off on the taxpayers. Its great to see, don't you agree? However, That's going to leave CHSRA with a little problem... forthrightness hasn't been their strong suit so far. But who knows, maybe their new PR company can pull one off on Lahood, cuz that's what we're paying them for afterall. We'll see. Once again, an anonymous is faced with the problem of claiming credit for a past statement that, well, is anonymous. No one will take you seriously on this blog unless you pick a pseudonym. Peter if you have a counterpoint to make, make it. The original point, specifically that CHSRA is untrustworthy (with its lowballed costs, and overinflated benefits, including wild job creation projections, among other "misinformation" is peddles), and it will become an embarassement to the administration and any other politician that fails to start exercising some judgement, still stands, unchallenged. I believe the high speed train need only deliver a fifth of the stated benefits to be a worthwhile project to build at twice the stated cost. It will be the first major step to decouple our transportation costs from the cost of oil - and when the economy recovers and we're back at $200/barrel oil, that sort of planning will be viewed as downright sage. Rafael, my point is that Amtrak seems to believe that with the new requirement for freight PTC, the FRA will consider train control to provide guaranteed time separation, which obviates the need for buff strength. I'm aware that some subway operators are switching to trainsets, or "boa trains" as you call them. This permits a door-free aisle that runs the length of the train and encourages passengers to distribute themselves accordingly. If a car's HVAC system fails, those of the adjacent cars can compensate to some extent. The lack of doors also means passengers can more easily move toward the end of the train in the event of a tunnel fire. However, this sub-thread was kicked off by a discussion of replacing the BART fleet over the next decade. As you can clearly see in this photo, existing BART cars feature sliding doors at the ends, as well as two dedicated bogies (not shown). This old-fashioned concept proved invaluable just recently when the Bay Bridge had to be closed for several days because an earlier repair on the old east span had failed. BART staff quickly boosted network capacity by increasing consist length by one car, the maximum possible given existing platform lengths. Even if BART were to switch to trainsets with door-free aisles, it would have the choice of conventional cars and articulated designs with shorter, wider car bodies supported by Jacobs bogies. Consists based on the former can be reconfigured in a stabling yard, though it involves more work than basic coupling and yard switching. Articulated trainsets offer greater stiffness, including better protection against jackknifing in the event of a derailment. However, they can only be broken apart in heavy maintenance yards since the work requires the installation of temporary end bogies. As always, there are trade-offs. Well, my counterpoint is that you have offered nothing to support your own unsubstantiated claims of exaggeration by the Authority. Therefore, no need by me to answer your claims. we all hope that FRA will use the requirement to implement PTC to define a regulatory path toward mixed traffic, i.e. heavy freight and light passenger trains sharing track. However, H.R. 2095(110th) a.k.a. PRIIA failed to mandate a specific technical standard for that implementation or, to properly fund the effort. Absent industry agreement on the technology, FRA evidently feels it doesn't own the process of migrating to an active safety paradigm. Therefore, it is not (yet) in a position to provide planning security to those passenger rail operators that need to replace aging rolling stock and would dearly like to buy modern, efficient, off-the-shelf but non-compliant rolling stock. US Railcar, the successor company to Colorado Railcar, may profit from this uncertainty for a while. It manufactures the only FRA-compliant DMU products on the market. While heavier than the foreign-built UIC-compliant alternatives, these are at least much lighter than existing consists pulled by diesel-electric locomotives. For commuter and regional applications involving frequent stops, that translates to at least limited relief from high fuel cost and brake wear. OT, but what the @%$# is the Guvernator doing in IRAQ??? Don't we have more important things going on in CA? I understand that he needs a vacation occasionally, but does he have to prove his manhood by visiting Iraq? What does a visit to Iraq do for anyone other than him? Iraq is one of the few places where the US flag flies that is more screwed up than California. He could visit Michigan or Nevada, but that would look insensitive. As a naturalized citizen, Schwarzenegger is barred from running for POTUS or VPOTUS in 2012 and, he would have zero chance of mounting a successful challenge to Barbara Boxer in 2010. My take: this is the beginning of his loooong farewell tour. With the state budget horribly constrained, expect more hobnobbing between now and Jan 3, 2011, when his second and final term expires. Politically, I don't expect he'll fight for much of anything between now and then, except perhaps aganst new taxes and for the controversial $11 billion water bond. He is a Republican from LA, after all. Let's hope whoever succeeds him will be a more outspoken proponent of California HSR and smart population growth in the central portion of the Central Valley. @anon, nevertheless, you may as well change parties since your strong point seems to be making baseless accusations. There is no secret plan of deception here. As as some one who works for the railroad and may well work for hsr, fingers crossed, I have paid attention to this project and there haven't been any surprises. When I voted for prop 1A, I knew the route would be up the caltrain row, I knew it would be via pacheco and tehachapi and that it would stop in the valley towns, and I knew there would be nimby opposition, and I new to expect certain delays due to politics, and I had i feeling the feds would kick in, which, ta da, they are planning to do, and I knew that it would take time to get things rolling before we turn dirt. So I don't know what you were reading, or who you were listening too, or at what stage you became confused, oh excuse me, "deceived" but i have never been in touch with anything but reality. Joey is absolutely right. With its limited market, proximity to LAX and airport constraints, San Diego is a destination, not a transit point to air transport. An HSR station at Lindbergh has no purpose. Qualcom, served by a well-designed transfer to lightrail and/or extension to downtown would be far faster and have much higher utility to more people. The problem is that local interests have decided that HSR exists only to bring cash to their "Destination Lindbergh" project. "There is no point of having an airport stop if the only purpose is to get people from SAN to downtown. There are already plans to put light rail and COASTER stops at Lindbergh; a 1.5 mile HSR trip makes little-no sense at all. The airport HSR station becomes dead weight, only serving a few people in Escondido who want to get to the airport." Qualcomm really isn't any better than the airport. Plus it's farther from downtown. my point is that Amtrak seems to believe that with the new requirement for freight PTC, the FRA will consider train control to provide guaranteed time separation, which obviates the need for buff strength. potential requirement when trains operate at very high speeds above track class 7 / 160 mph. If they were looking at leaping to existing non-FRA compatible equipment, by using PTC to create a time-separation environment, they would have quoted the usual HSR equipment top speeds of 186-220mph. Hence the more logical conclusion to leap to is that Amtrak is looking at modified equip that would be lighter than Acela but heavier than existing Euro/Asian trains, in order to meet all or some of the FRA-compatible requirements. One rumor of thumb that's been floating around lately is that one or more of the existing Euro/Asian HSR designs can be upgraded (or perhaps more accurately downgraded) to meet FRA requirements, but with a roughly 10% reduction in top speeds account of heavier weight. Anon, I wouldn't read too much into the failure to cite 186 or 220 mph as a top speed. Amtrak could just be rounding in English units out of habit. If you wanted to be snarky, you could say that their schedules are all rounded to the nearest 10 minutes, too. It's possible the FRA would try to impose regulations that don't exist outside North America. But not all FRA regulations are about collisions with freight trains. Some apply even to railroads that are completely separated from all other traffic, like PATH and the Staten Island Railway. I know for a fact they make it impossible to run unmodified rapid transit equipment - I'm not sure about off-the-shelf mainline trains, though.